Just like that, my new baby is 11 weeks old and I am back to work. What?!? Where does the time go? So instead of ‘what I did on summer vacation’, here’s my essay on my 11-week break from working. First, I attempted to grow the largest baby on the earth. Although I didn’t exactly achieve Guinness Book-level baby, I came close enough. We have a seriously large child over here. I mean, they all grow up too fast but one Sir Davis has grown VERY quickly. It hurts a mama’s heart a bit to be constantly putting whole groups of onesies back into storage. We have blown tall the way to the 9-month stuff. 9-month old baby clothes! Sniff. 17 lbs. Also, #backache. And this picture is several weeks old. 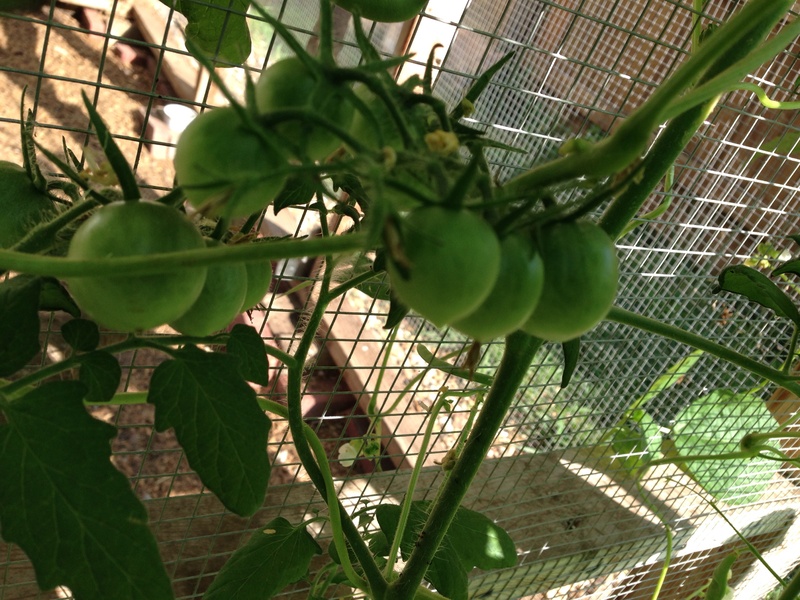 Second, we have also pretty successfully grown the largest tomato plants on earth. They are threatening to take over the entire garden. Well, the cherry tomato is trying to take over all the other tomatoes at least. I can’t really claim this as a maternity leave activity because we have done exactly nothing to make them so huge. I do sneak out there when I can to tend things when I can. Up next: canning tomatoes? What are we gonna do with all these? Fun times in the garden. 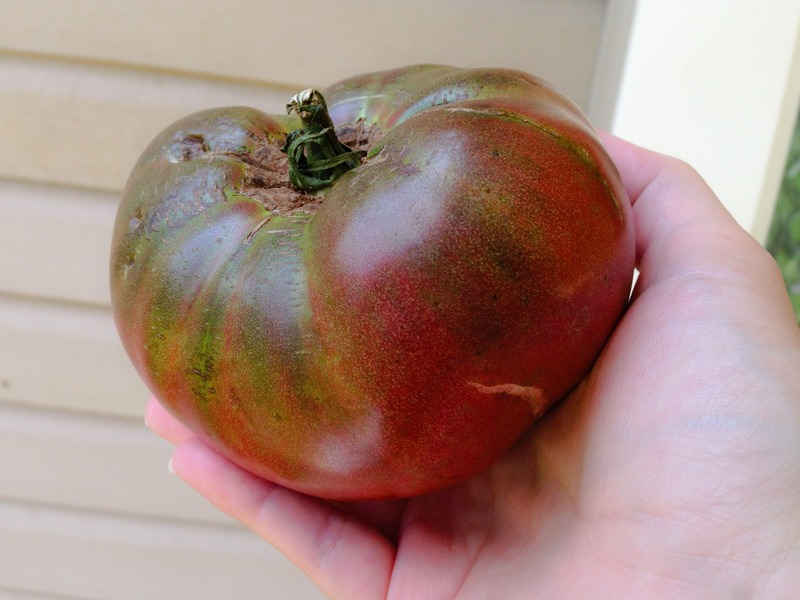 Large tomato. Our secret is… nothing. Luck. Third, we have all taken luxuriously long naps, day in and day out. Yes that is a LIE. Ransom’s daily nap has gone from a solid 2.5 hours to more like 45 minutes some days. I can’t complain, many kids his age don’t nap at all. Meanwhile Davis has become the champion of cat-napping. 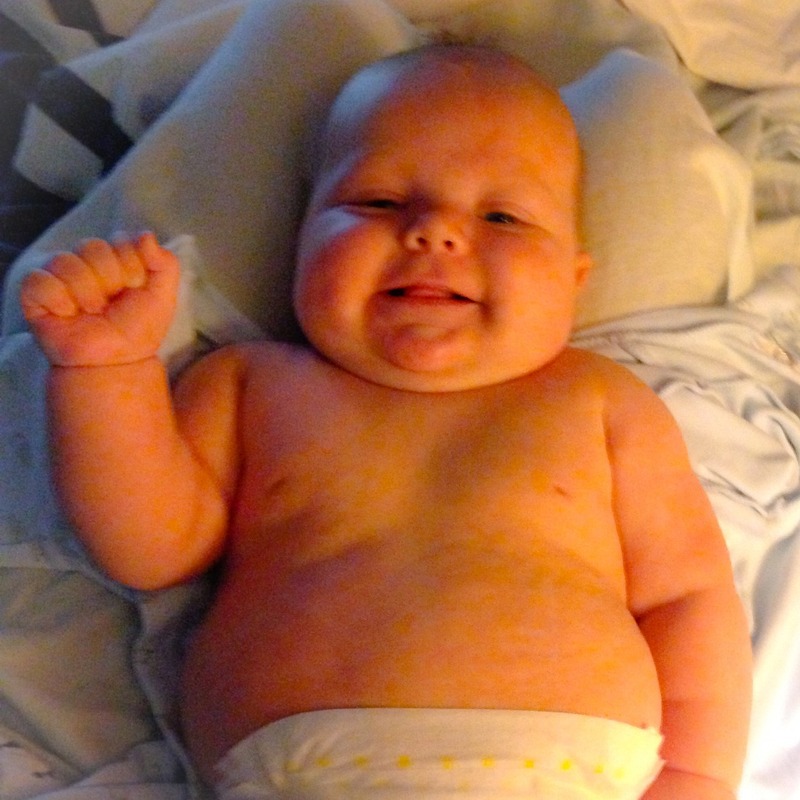 No, its not good for his little 11-week-old brain development, but I mean honestly, what am I gonna do. 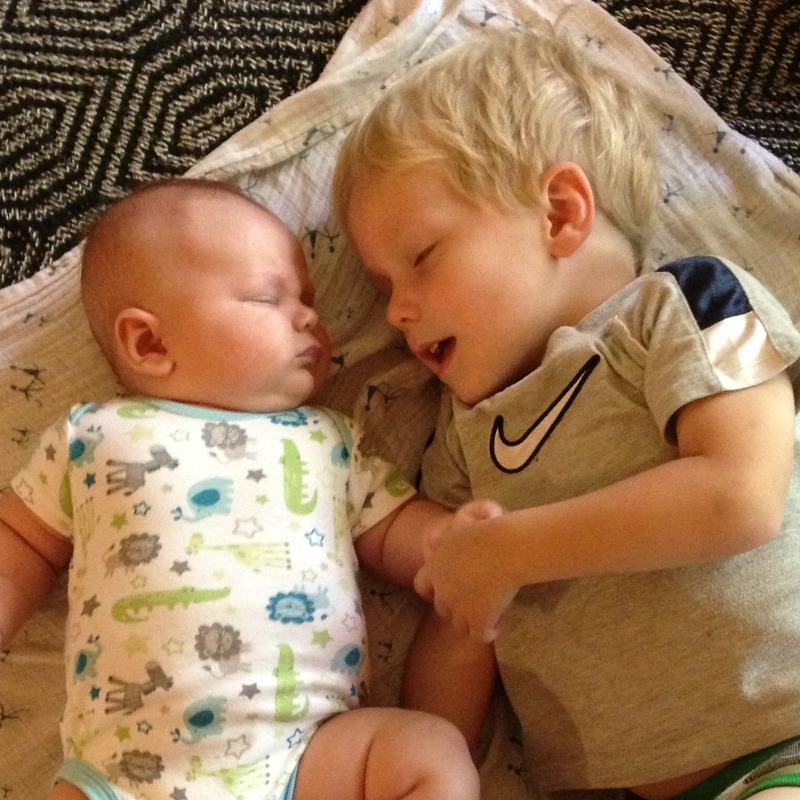 There’s no arguing with babies sometimes. They wake up when they feel like it. No one is actually sleeping in this picture. Fourth, we have played with the LEGOs. Pirate ships, tree forts, castles, race tracks, all manner of wheeled vehicles. 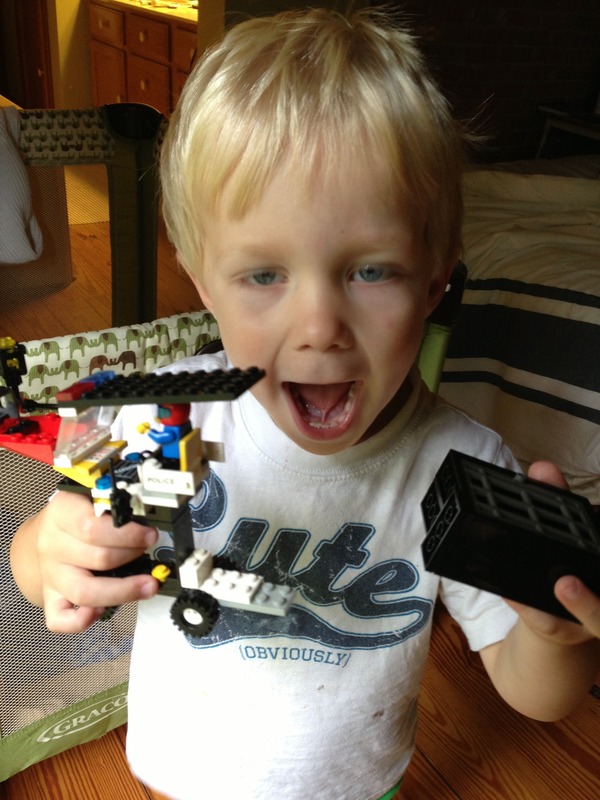 Ransom is a die-hard Lego lover, and he has entirely too many of them even at the tender age of 3.5. (They are hand-me-downs. #daddyisapackrat.) While playing Legos with Ransom, I have been cogitating on the most efficient Lego organizational system. I’m still tweaking it, but once we get done, I promise to share with the internet. When I do, a light will shine down from the heavens (with a chorus of angel voices) I’m sure because this has got to be one of the most enduring problems of the modern era. I mean, what do you do with ALL THESE TINY PIECES? His room is a serious construction zone/disaster area ALL THE TIME. Really though, what’s clutter in the grand scheme of things. Although stepped-on legos do hurt a lot. Ransom has entered the ‘weird picture face’ phase. Fifth, I dabbled in Paleo cooking & eating again. I wanted to try to recapture that “energized” feeling I felt during that Whole30 (okay whole25) I did last year. This year we made it just under two weeks (Whole11? ), and then we had some travel plans and it wasn’t worth sticking to the diet while staying with family. Plus I really wanted to eat some gluten. ha. But, now that the garden veggies are coming in, I am determined to up the health-factor in my cooking. So get ready for some OKRA recipes because we are going to have a lot of that to eat. That’s most of it! There was also: replacing the cabinet pulls in the kitchen, two weeks of swimming lessons, a stomach virus, a couple of trips to Columbus, a couple of power outages, a partridge, and two pear trees. Oh, wait, make that a couple of paw paw trees. yes, seriously. More on that later. Now we are three days into the next ‘new normal’, and struggling to adjust to another new routine. I’m now working half-days for the rest of the summer, and looking forward to it, but also missing our totally carefree do-whatever-slash-survival days. I remember the first time I went to a women’s conference. I was 23 and the sister-in-law of a friend of mine had invited me. I’d told her no a few times….I didn’t really “do” women’s ministry…I thought women’s events were only for middle aged women with perfectly coiffed hair who had memorized half the Bible, prayed for others 24 hours a day, and never made any mistakes. I was a newly minted college graduate with big dreams and little direction and couldn’t imagine what I would have in common with anyone else in attendance. Plus there was that tiny issue of the admission fee. I was playing violin at churches and weddings on the weekends and working part-time as a sales clerk at a high-end children’s boutique during the week. Neither of these jobs brought in a whole lot of money and I figured paying my electric bill was more important than buying a ticket to an event. The third time I tried to decline the invitation, an “extra ticket” magically appeared and I found myself agreeing to be picked up after dinner the following Friday night. The speaker that weekend was a young, vivacious Bible teacher named Priscilla Shirer who spoke truth to places in my soul that I didn’t even know needed it. A month or so later, the director of my church’s women’s ministry asked if I would be interested as serving as the first ever “young women’s” rep on the 25-member women’s ministry committee, to which I agreed (although to this day, I feel that I was an unlikely candidate). When Priscilla returned to our church a year or two later, I found myself leading worship for the conference instead of being the scared kid sitting in the back of the room. But when I moved to Nashville, I moved here for music and for a new town, not for anything to do with women’s ministry. I’d enjoyed my time serving on the committee but it honestly never occurred to me that it would circle back around and end up taking center stage in my life. But then the opportunity to work for Kelly Minter came along and I am so blessed to be part of seeing ladies lives impacted each day. And I’m grateful daily for those ladies that poured into me ten or so years ago. They say that hindsight is 20/20 and as I look back to the hours I spent planning a “Bible Study Introduction Tea” and prepping for the annual women’s conference, I recognize that those experiences weren’t happenstance; they were preparing me for the tasks that I do on a daily basis at work. But never has my women’s ministry journey come into play more than this summer as I work to plan the first ever “Cultivate: A Women’s Gathering Around the Word.” It has been on Kelly’s heart for a while to create an opportunity for women to come together and study the Word and worship in a simple environment. Kelly will be teaching three sessions and our dear friend Michelle Margiotta will lead worship (Adam Moritz who produced my album will jump in on acoustic guitar and I’ll round out the trio on violin). And because Kelly loves the people of the Amazon jungle dearly, all proceeds from the event will go to benefit the work of Justice & Mercy International, the organization that I traveled to Brazil with last year. Biblically focused and stylistically simple, this will be a time to seek God’s Word, worship with an elegant trio of musicians and enjoy the warmth of community. This event features Bible Teacher Kelly Minter and worship leader Michelle Margiotta. All proceeds will support the work of Justice and Mercy International. Tickets can be purchased online HERE, or in person at Rolling Hills Community Church or by calling their box office at (615) 861-3663. All tickets are general admission. For group ticket purchases of 10 or more, it is possible to reserve seating together. Please contact Bethany Bordeaux at info@kellyminter.com to reserve your group seating, or with any questions you may have about the event. 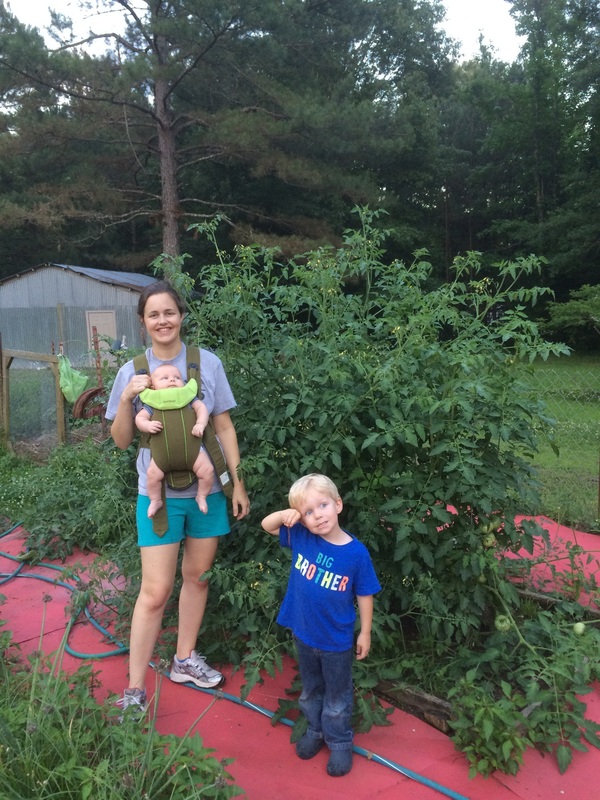 A few weeks ago, Mary Hall graciously took us on a tour of this year’s Johnson family garden. And it got me thinking that I should follow suit. Now before you get all excited, lets review that I don’t have a large garden. In fact, I just have a few things growing here and there, but what I’ve got is strategic so I just had to share. 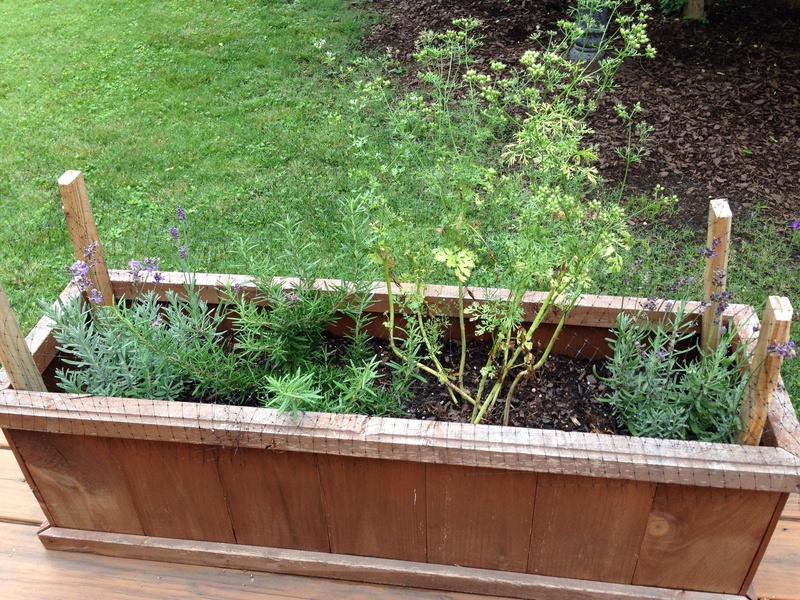 First off, we have an herb box on our back porch willed with lavender, rosemary and cilantro. Everything grew gangbusters this year thanks to some stakes and netting I added over it. 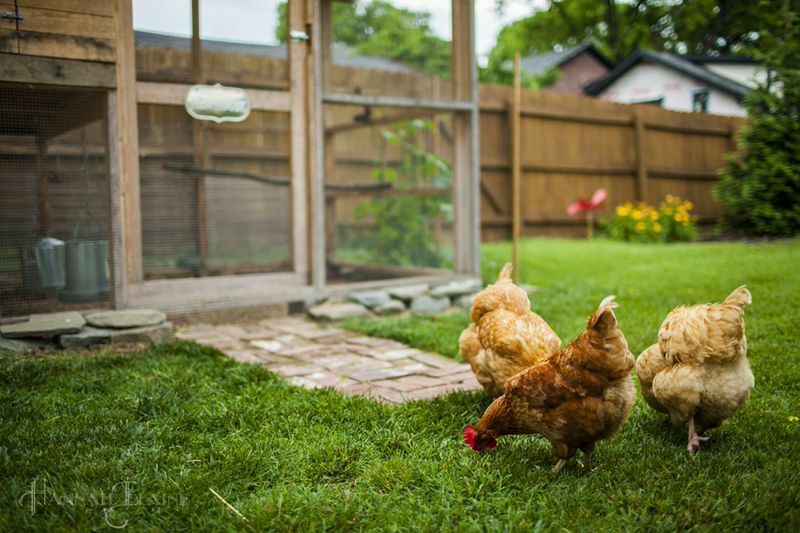 Last year, the chickens decided that the herb box was the perfect size for them to hop in and take a dirt bath so our herbs didn’t make it very far. Although the netting is only loosely draped over the top, it’s been enough to deter my feathered friends from trying to get cozy so I’ll probably continue this practice in years to come. Lavender, Rosemary, Cilantro. Yummy tasting and yummier smelling. 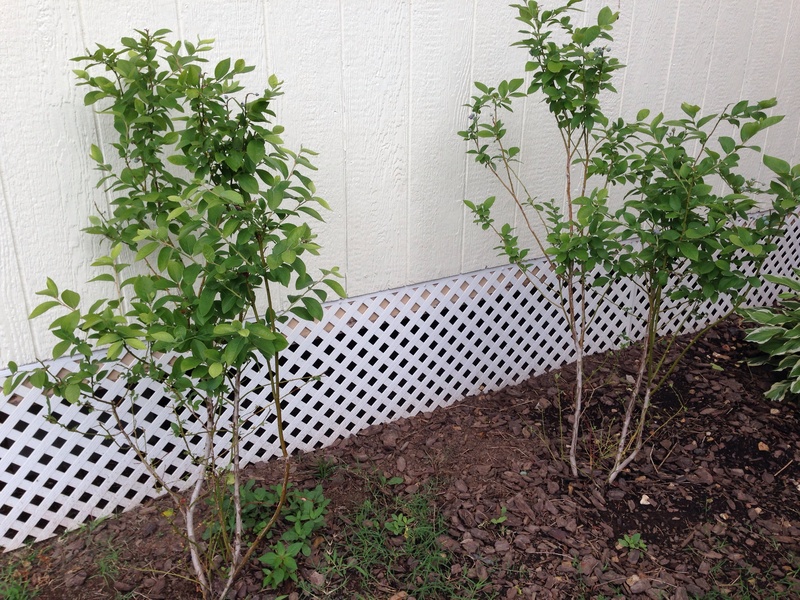 Next is a new addition to the yard….two blueberry bushes. 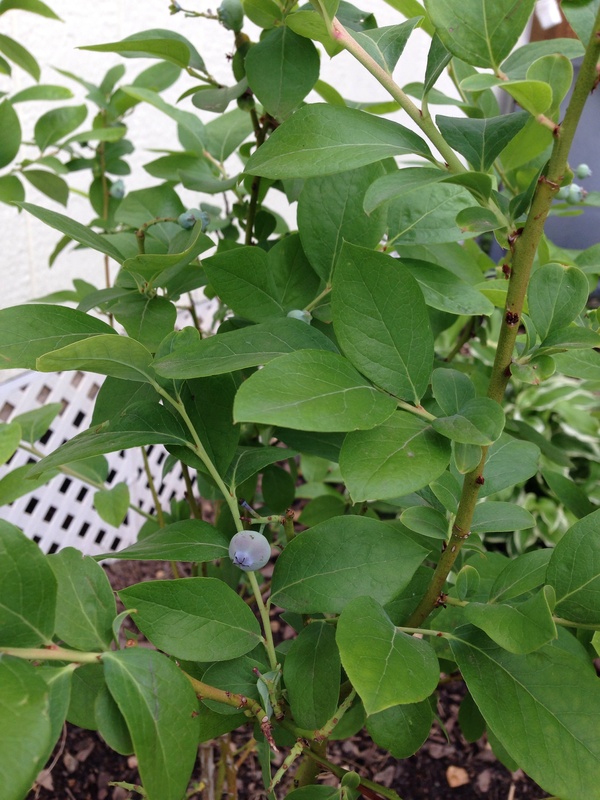 If you remember from years past, Keith and I both really love picking blueberries (see here and here for more blueberry adventures, or here and here for some yummy blueberry recipes) so it really only made sense for us to add our own bushes. Louisa the chicken has developed a penchant for jumping up to grab the ripe berries off the top so we may not end up getting very many until the bushes get bigger. But I’m glad to have them in our yard nonetheless…and have enjoyed the few tasty berries I’ve already been able to pick from them. Our two blueberry bushes. Tasty fruit and nice addition to our landscaping. Berries! 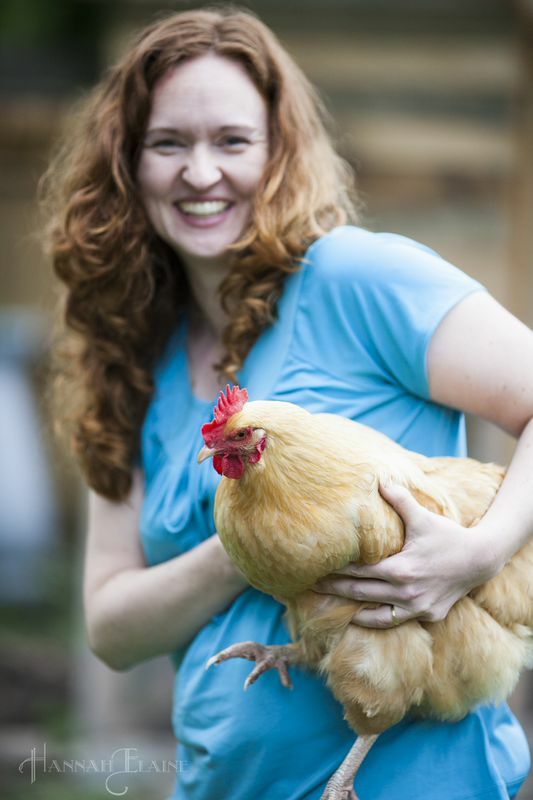 Wonder how long before Louisa the chow-hen figures out they are there? 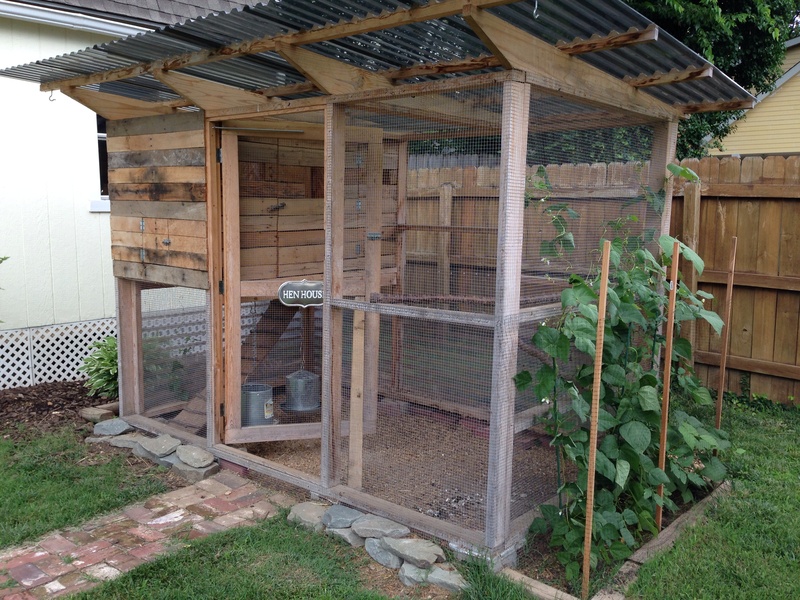 Last on the list of growing our own food this year is the actual garden portion of our “garden coop.” Last year I decided to bring some shade into the coop by growing pole bean plants and cherry tomatoes up the side of the coop. (You can see the start of that project here, although I apparently neglected to post update photos.) The beans were wildly successful and the tomatoes were as well so I reprised the project this year and planted from seed long before the last freeze not knowing that you’re supposed to start seeds inside and that beans and tomatoes both have a planting season. I don’t know if it’s all that fertile soil from the chicken poop, or just dumb luck or a combination of both, but my little seeds are growing like champs, climbing the coop wall like a trellis and already bringing shade to our hens. The bean plants are full of blooms and I have several baby tomatoes on my tomato vines. I put some bird netting around this garden too to keep the chickens from digging up my plants and so far it’s been successful. 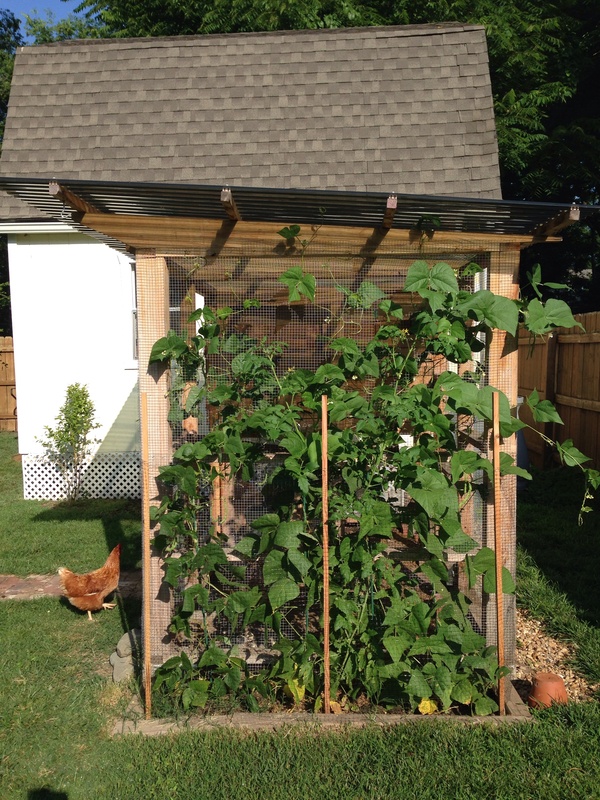 Edible shade….green beans and tomatoes growing on our chicken coop! We should have our first harvest in a few weeks! Look at how huge those tomatoes and bean plants are! 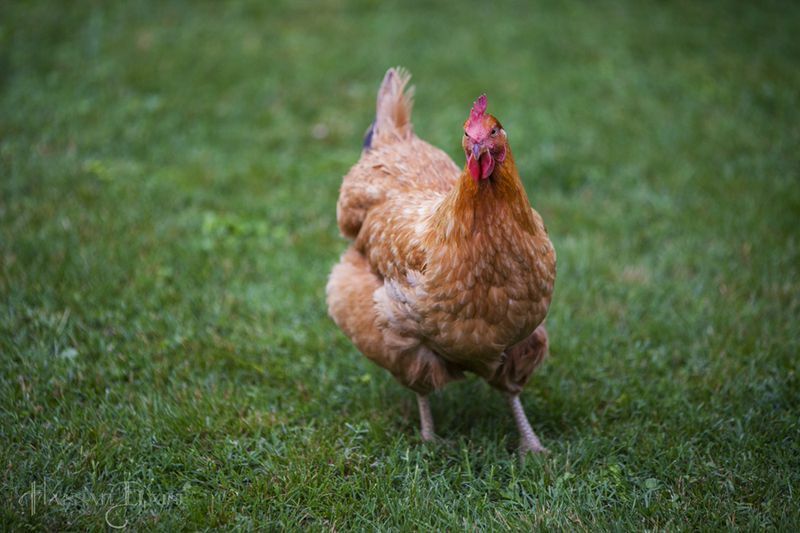 No stakes needed….they hold themselves up to the side of the coop. 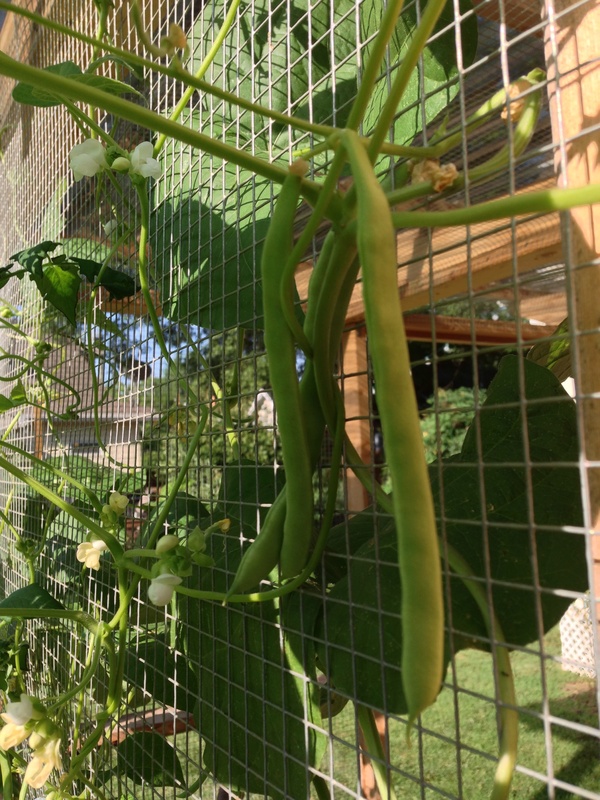 green beans ready for harvest! 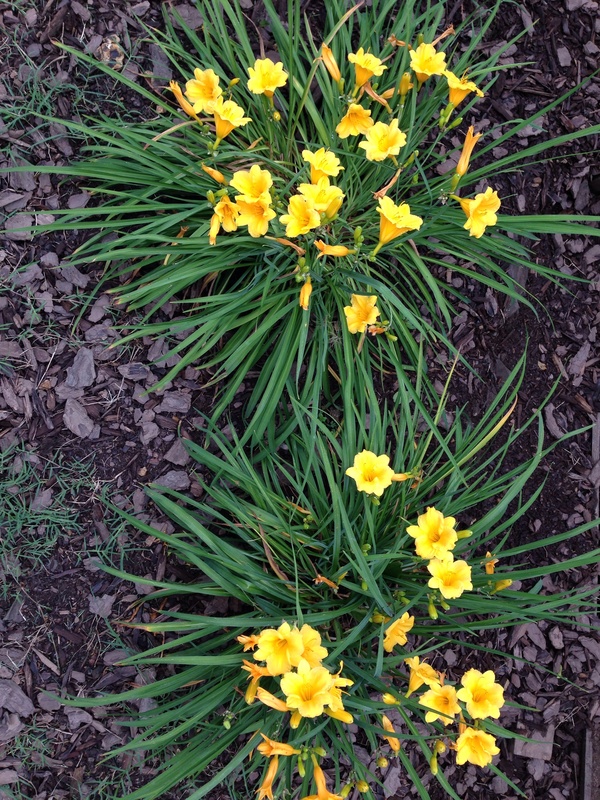 And on the non-edibles front, we did a few hanging baskets and such, but the most notable victory has been our daffodils. Aren’t they lovely? So there you have it. Not as fancy as the all-out farm that Mary-Hall has cranking at her place, but always exciting to grow your own food. Two Novembers ago my dear friend Jessica and her husband came to visit us. Jessica has home decor style oozing out her very pores and so I naturally mentioned to her that I was stumped on what to hang above my desk in our office/music room/library. 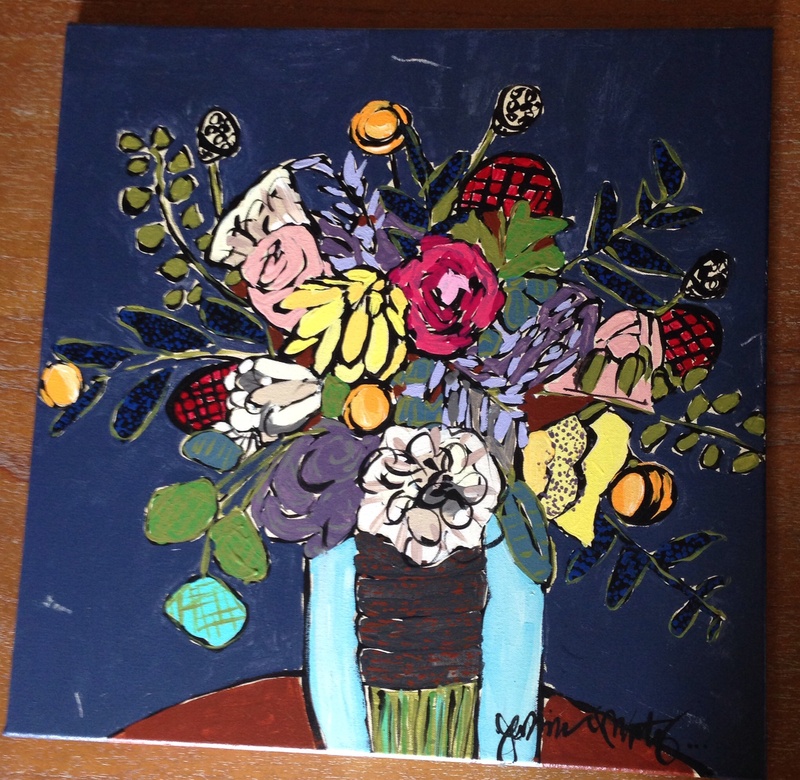 She suggested that I needed a colorful painting and showed me some floral pieces online by a favorite artist of hers that I loved but couldn’t even begin to afford. But Jess was completely unphased and said she’d painted a similar piece for her house…what colors did I like? She bet she could make me one. Barely 3 days after she got home, a gigantic package showed up on my front porch with a beautiful and bright painting inside. I loved it and immediately hung it above my desk. It made me smile every day as I worked. 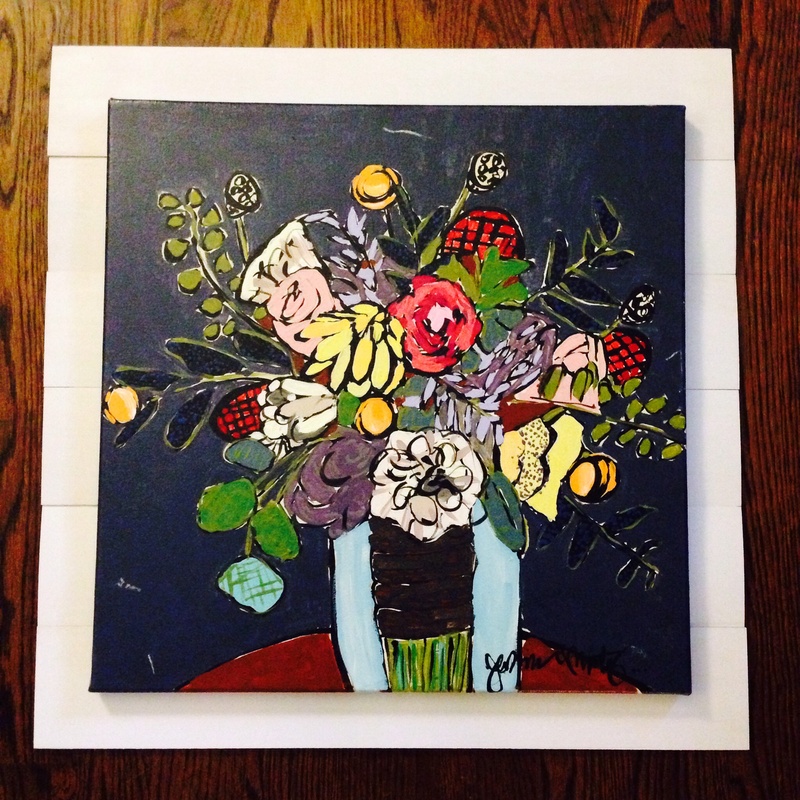 My happy flower painting by my dear friend Jess. Girl has an eye for decor…AND some mad painting skills. Ever since then, I have wanted to make some sort of whitewashed frame to make the happy painting pop even more against the chocolate brown walls. But as I’m sure many of you have experienced, it just sort of sat at the top of my “to do” list and never got done. Until I had the trifecta of perfect circumstances that made me put my intentions into action. First, I had a rare free afternoon. Second, Keith had a few yard projects he wanted to knock out so I was hunting for a DIY to do and third, we’d just gotten some Hatch Show Prints framed on sale at Michael’s so we were in the picture-hanging mood. I knew that I wanted something with a slightly whitewashed appearance. Something similar to when my friend Amy and I made a decorative shelf for her bathroom. I also really love the look of variegated planks (like on our chicken coop) so I decided that instead of doing a frame around the painting, I’d do one behind it out of slats of wood. I wanted something a little sleeker than palate wood and not as heavy as lumber, so I headed to Michael’s craft store and straight to the model-plane making aisle where I chose 6 slats of ultra-light weight Balsa wood. 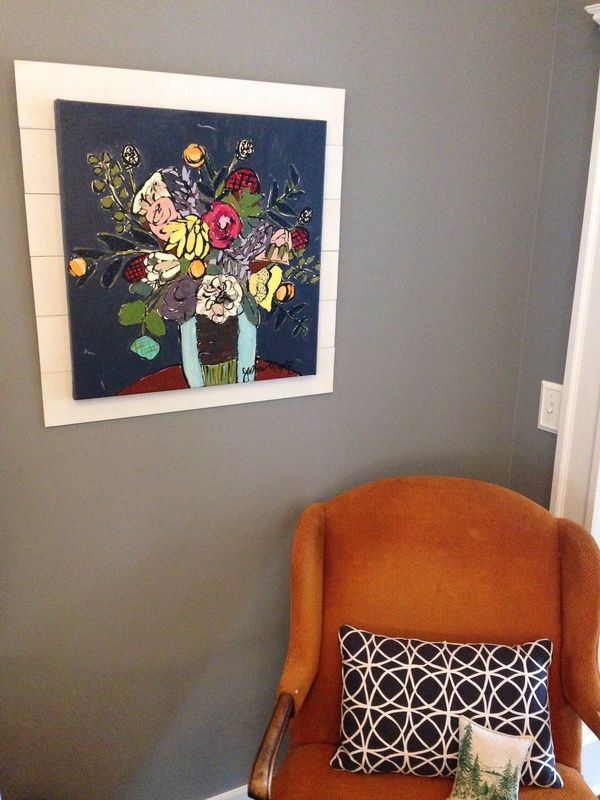 I got lucky because my painting was 20″ x 20″ and the Balsa wood slats were 4″ x 24″ inches which meant that 6 of them made a 24″ x 24″ square leaving 2 inches on each side of the painting. The boards were $3.49 each so with tax the wood for the project cost less than $25. 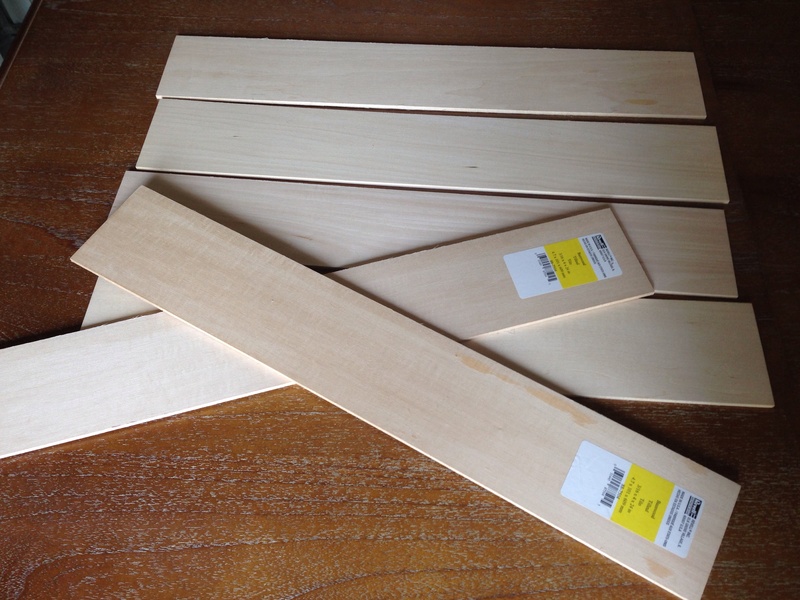 Balsa wood planks from Michael’s. I laid out all the planks on a sheet of plastic and decided to go with a light grey paint instead of the minwax stain that I’d used on the shelf project as I felt like it complimented the white flower accents better than a stain would have. However, I diluted the paint with water to it wouldn’t be so thick and would give more of a stain appearance than a paint appearance. 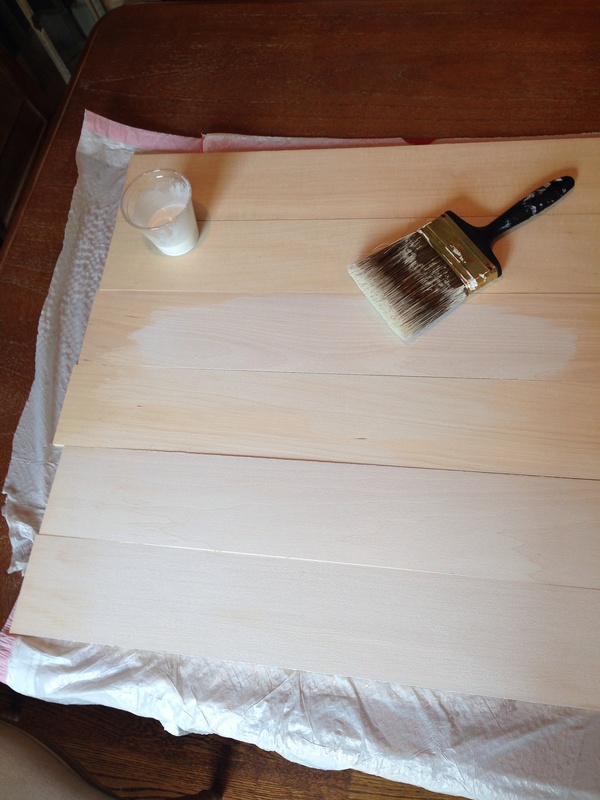 It worked really well and I painted all the boards with two thin coats. The hardest part about the project by far was centering the boards on the back of the painting. I laid the painting face down and then measured the slats and the painting to make sure that all sides were equal. Then starting in the middle and working out, I nailed each slat to the wooden frame of the canvas using tiny tacks and a hammer. (Make sure your nails are tiny as balsa wood splits easily.) Then I attached a picture hanger to the back (we had one in the shed, but they are only a dollar or two if you have to buy one) and voila! The finished product!! So excited about how it turned out! The Hatch prints we’d gotten framed (that I mentioned at the top of the post) were originally intended to be hung in our living room which has gotten a bit of a facelift as of late. But as seems to often happen with redecorating, hanging one print turned into an all-out fruit-basket-turnover of wall art throughout the house. While I loved having the painting from Jess above my desk, I also wanted it somewhere that everyone would see it…not hidden in my office. So we gave it a home on the most prominent wall in our living room where it will make everyone who comes through our doors smile. Hanging next to it is my Nickel Creek reunion tour Hatch Print from the Ryman show, while my Eucharisteo painting adorns the wall to the left and a wood-mounted photo of a piano by local photographer Eden Frangipane (it’s the first photo you see if you click here) hangs on the wall opposite. And our living room is now officially the happiest place to be. There are definitely perks to having wallflowers. My happy painting and my favorite chair. The perfect nook. 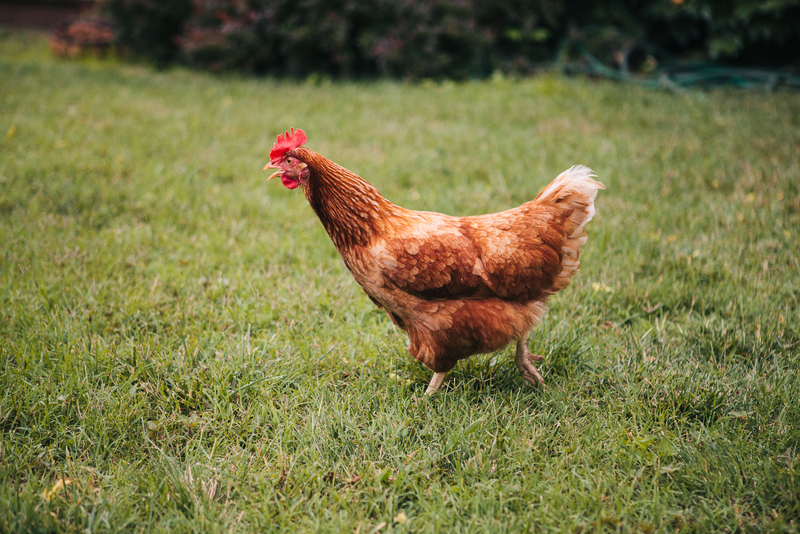 All the vendors absolutely cracked up when they found about the chickens and the coop and then became sort of obsessed with them. We even incorporated the ladies into several of the shots…lured into doing pretty much anything with the help of a few dried worms. 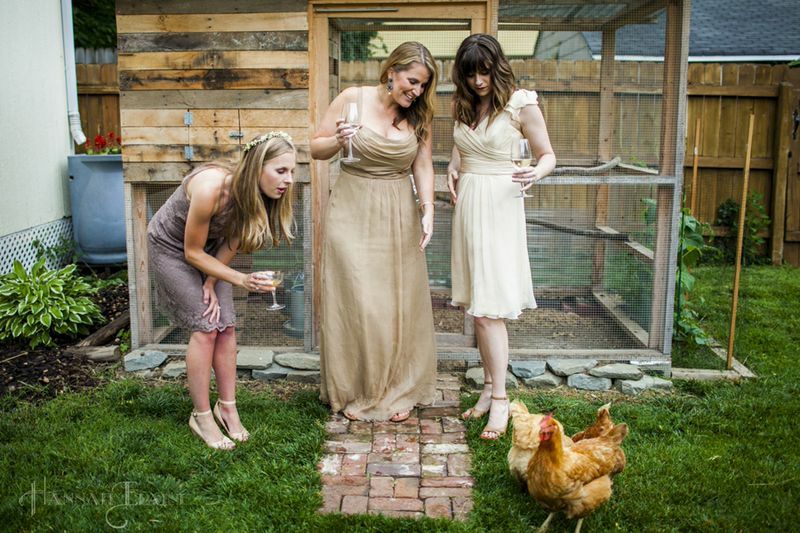 Since the ladies have already had their portraits painted, and won a photo contest, it seemed only logical that being included in a high-fashion, wedding-themed, professional-level photo shoot was the next progression in their path to fame and fortune. 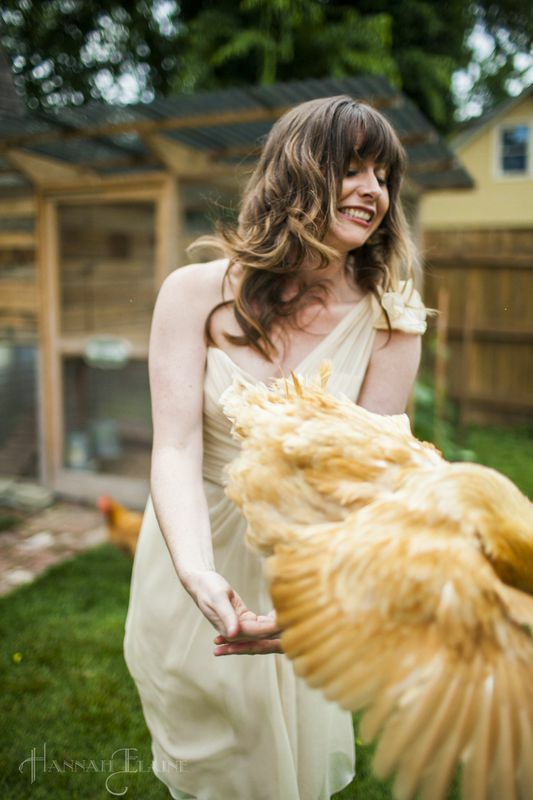 Our friend Hannah snapped some amazing photos that I thought I’d share with you here. So just scroll away and check out the captions. 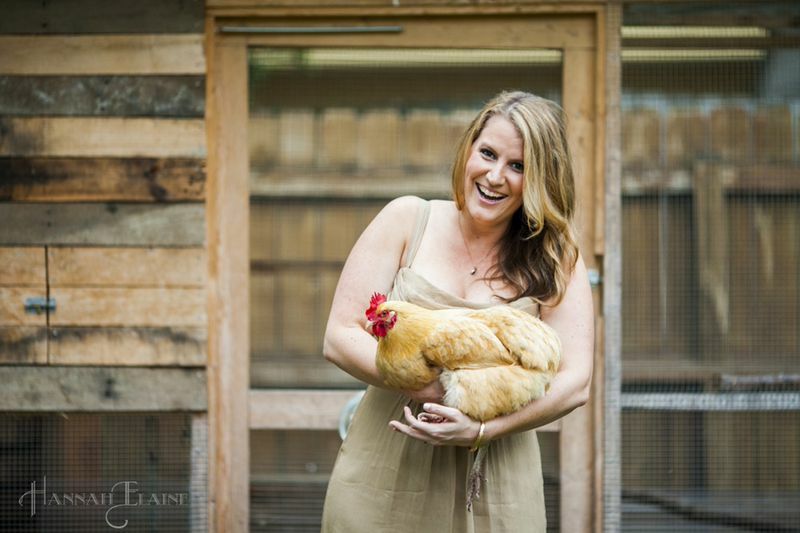 Photo Credit: Hannah Elaine Photography – Louisa is our jumper…nothing is out of her reach. She was determined to get to that jar of worms and Hannah’s expert timing caught this great shot of her mid-air. 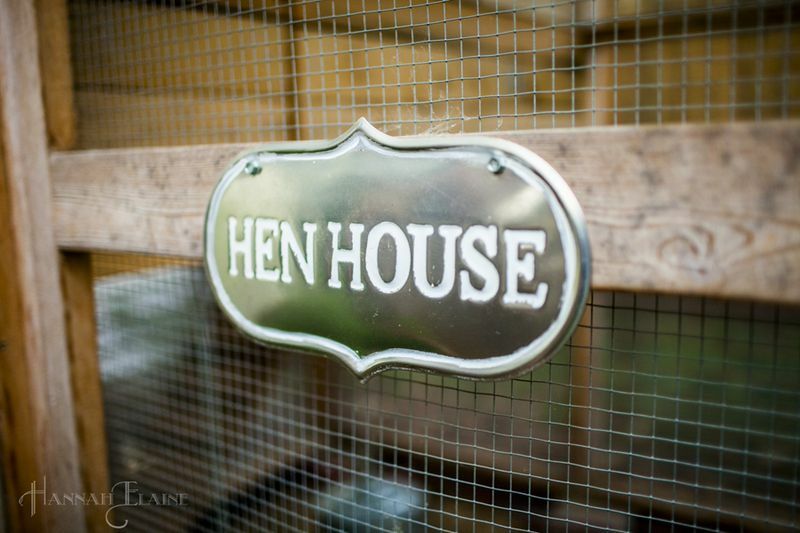 Photo Credit: Hannah Elaine Photography – Welcome to our humble abode. 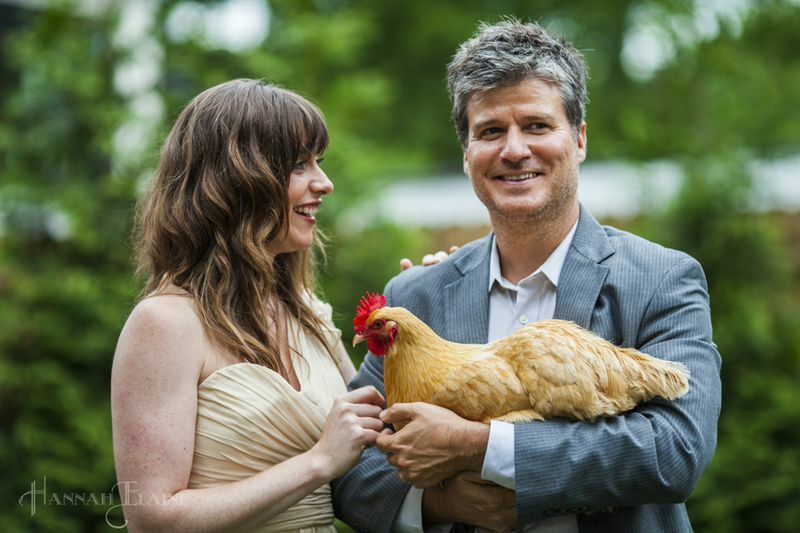 Photo Credit: Hannah Elaine Photography – Jane was so curious about what was going on…. 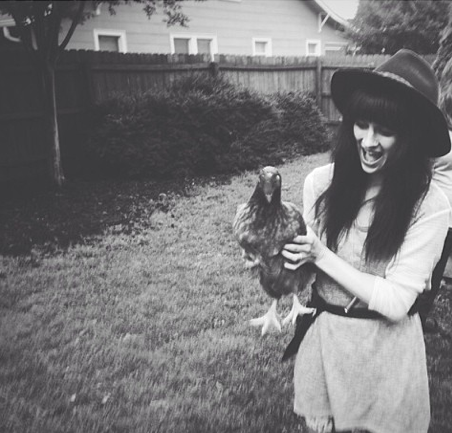 Photo Credit: Hannah Elaine Photography – …but Louisa was confused because everyone knows flowers don’t grow in jars. 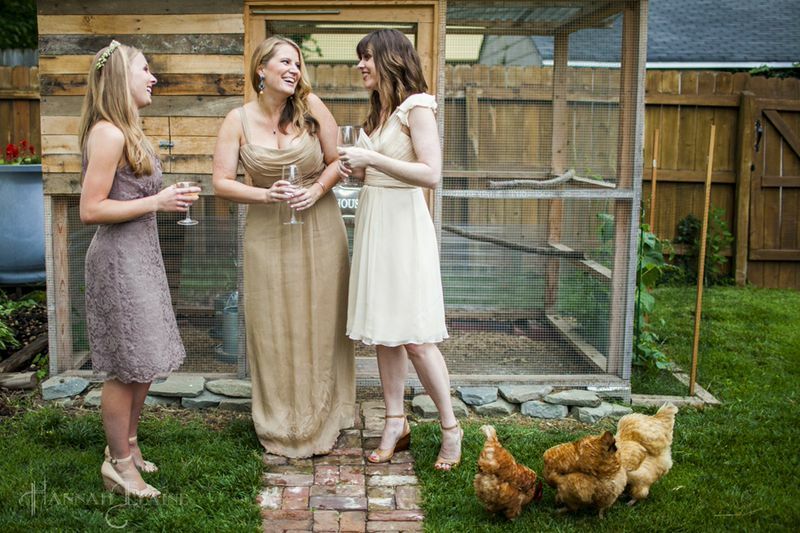 Photo Credit: Hannah Elaine Photography – Erin, Keely and I “clucking away” in front of the coop while the girls forage for treats. 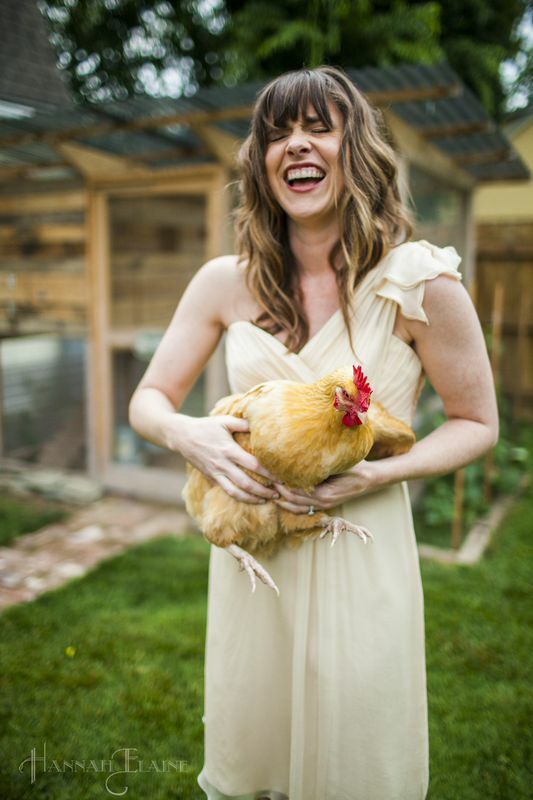 Photo Credit: Hannah Elaine Photography – Jane is jealous that she doesn’t get a pretty frock to flaunt. Photo Credit: Hannah Elaine Photography – Enjoying a quiet snack together. 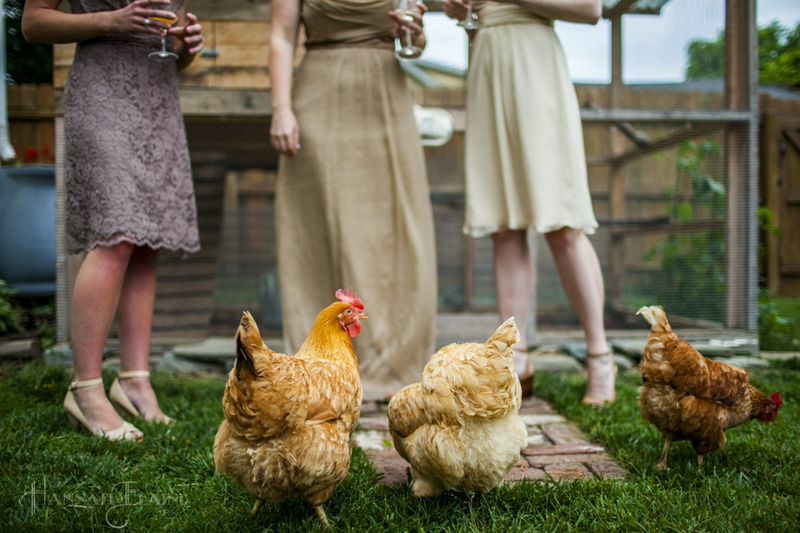 Photo Credit: Hannah Elaine Photography – The dresses were “you break it, you buy it” which proved not conducive to chicken holding. 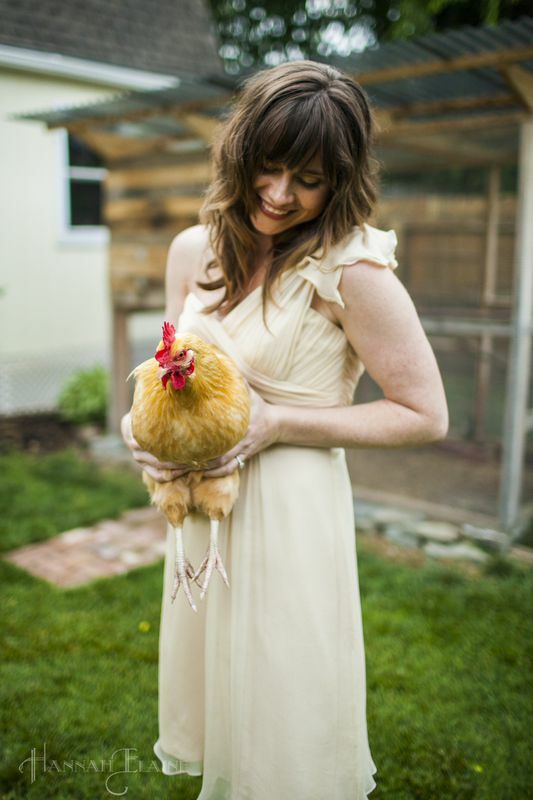 Photo Credit: Hannah Elaine Photography – Holding a chicken in a beautiful dress. The silliness of it all was just too much. 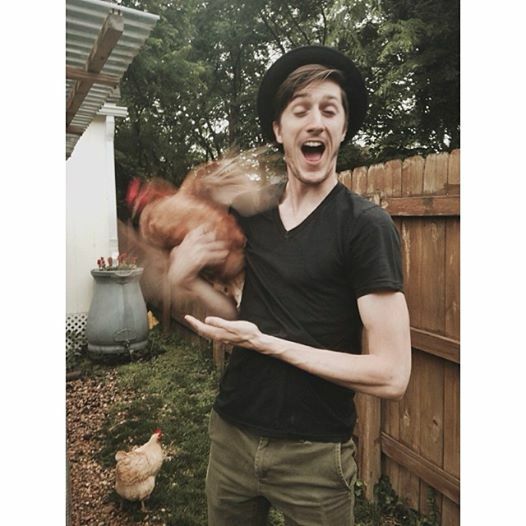 Photo Credit: Hannah Elaine Photography – …aaaaaaand……i’m outta here! The girls have also never met a stranger and love it when people stop by to see them which is a good thing because it seems to happen frequently. 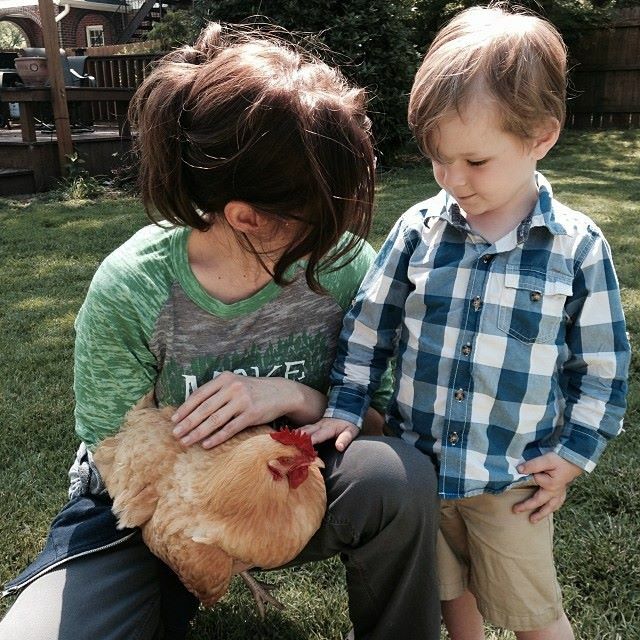 But when it comes to holding still for a picture, Beverly is the most patient with those not used to holding hens. Plus, she’s just so fluffy and yellow that it’s quite adorable. 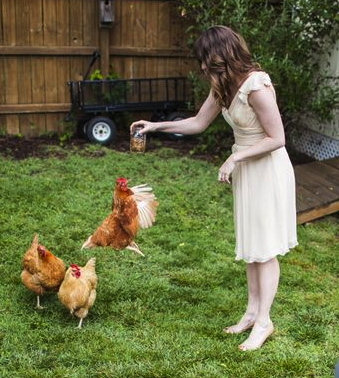 My favorite quote of all time is when a business contact of mine said, in the most serious tone ever, “Do you think Beverly Clucky KNOWS she’s the prettiest of all the chickens?” So here you go, just for fun, a few additional pictures of Beverly with the friends she’s made along the way. Oh, and one of Louisa, just for good measure. 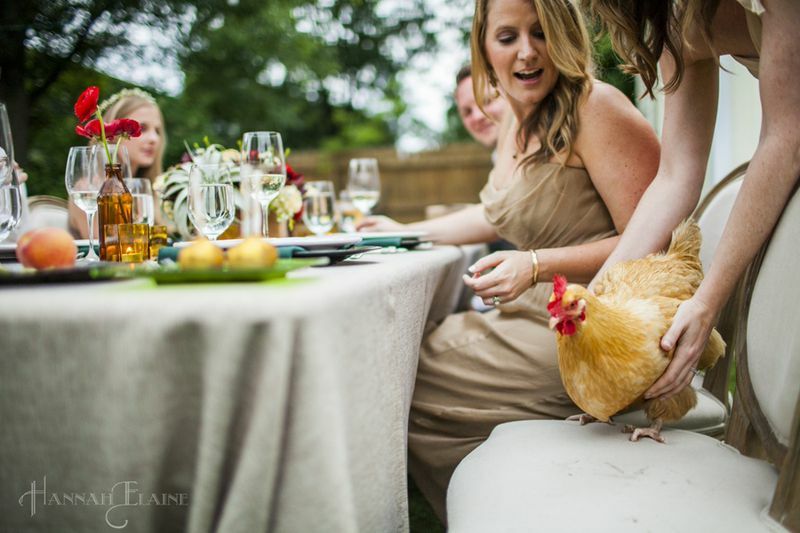 Photo Credit: Hannah Elaine Photography – Elaine of “Events by Elaine” noted it was her first time having chickens as event props and decor. 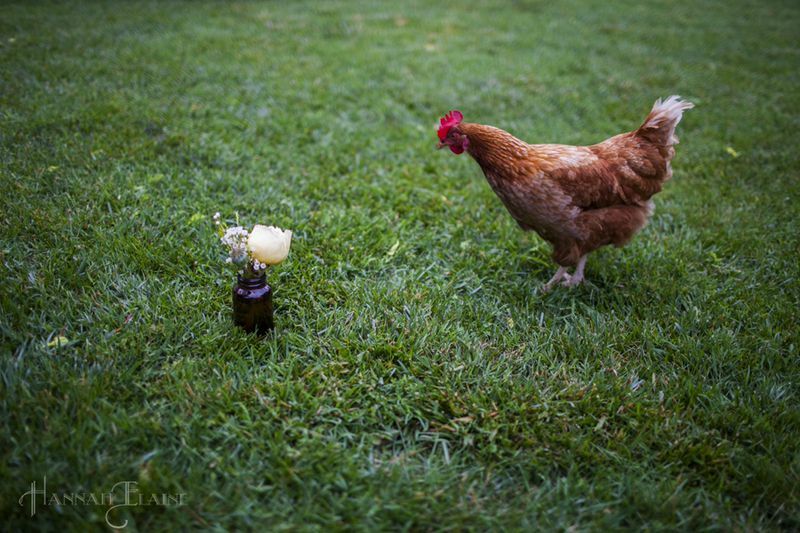 Photo Credit: Hannah Elaine Photography – Keely wasn’t so sure at first, but Beverly won her over. Photo Credit: Reuben Bidez – Hayley (Make Up Artist) posted this pic of her and Louisa to Instagram….Lousia wasn’t feeling it and jumped down shortly thereafter. Photo Credit: Hayley Bidez – Reuben, the bartender behind “Peace In The Valley” clearly picked the wrong girl to snuggle with. Love the live action shot as Louisa gets away, and how calmly Bevery looks on in the background. 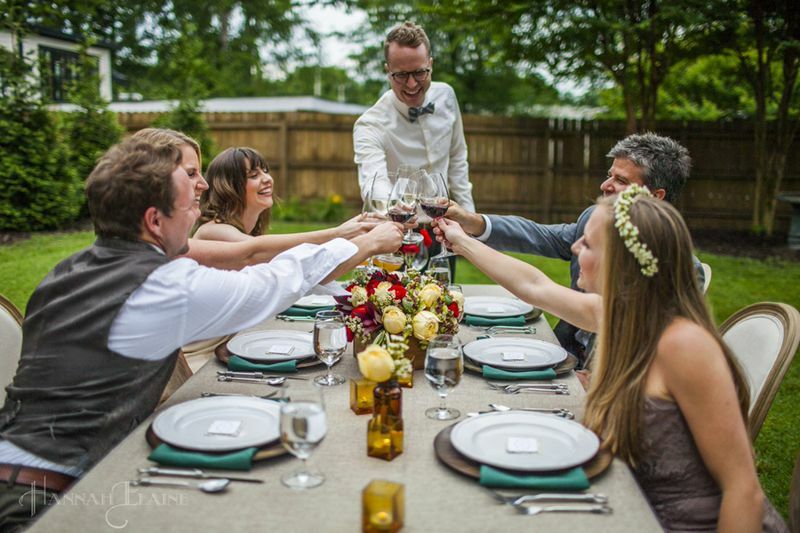 You may remember the backyard dinner party shoot that took place at the yellow barn a few weeks ago. 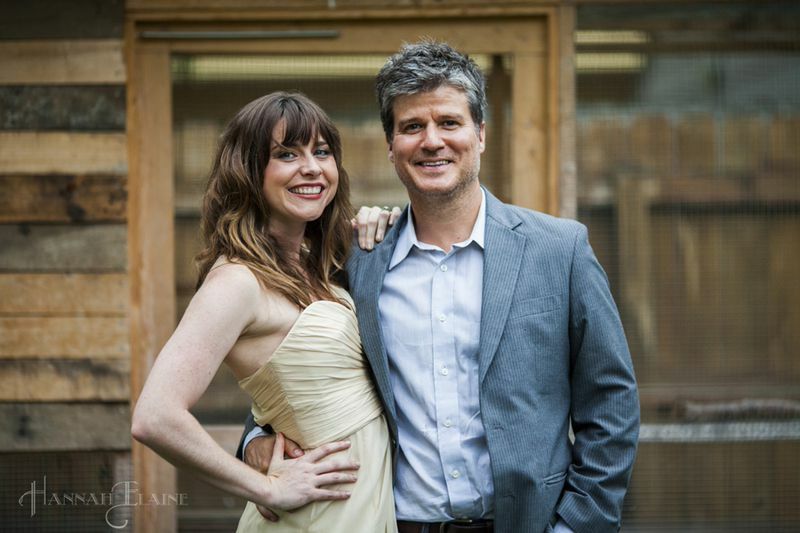 In addition to all the amazing vendors that created everything from set design and paper goods, to flower arrangements and cake pops, the makeup artist brought her singer/songwriter husband who also has a flair for mixology. 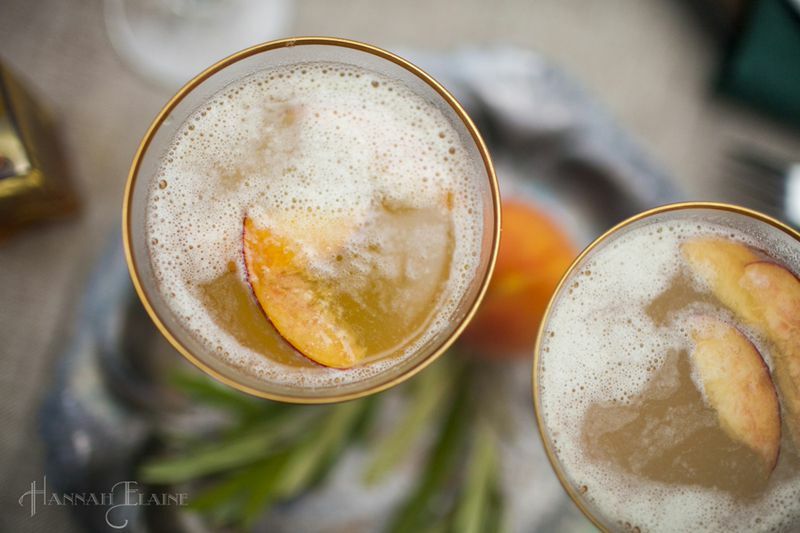 I’m not much of a cocktail drinker, but Reuben’s peachy concoction was quite tasty, and when I realized that I could pass along a brand new recipe to you guys, I couldn’t resist posting our first, and most likely only, cocktail recipe. 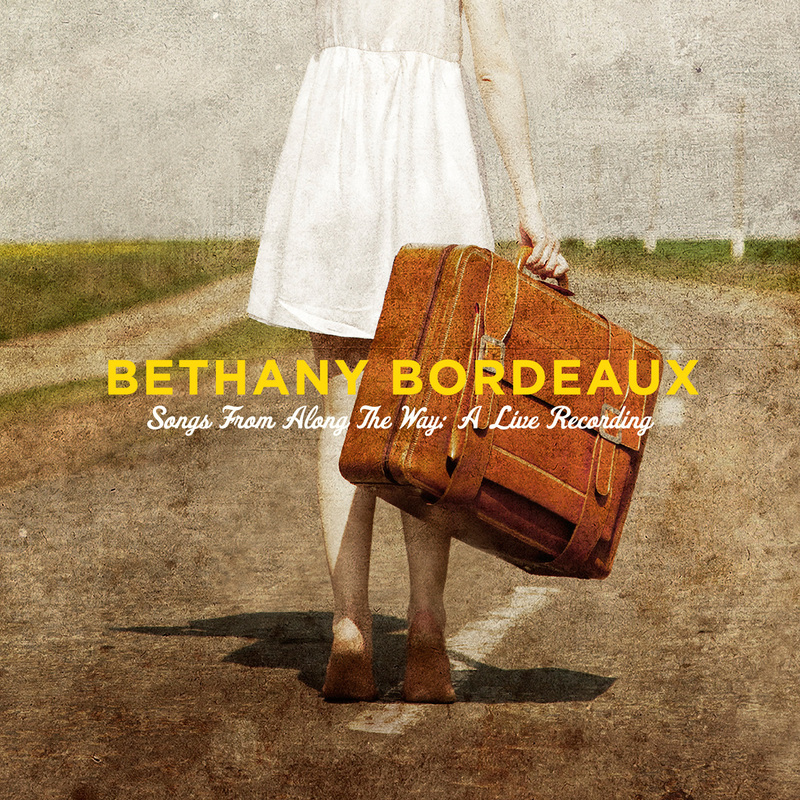 And be sure to check out www.reubenbidez.com and buy his music….think of it as a way to leave a tip. ***Of course, everything always tastes better with really fresh peaches. 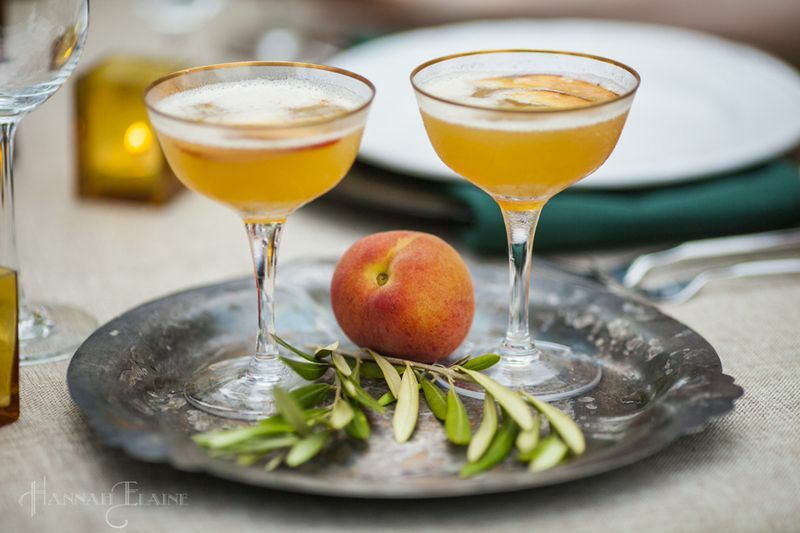 For this shoot, we shopped local with peaches from The Peach Truck. You can find the truck easily in the Nashville, TN area, on their Small Town Peach Tour, or by ordering online. One of the things I most love about Nashville is the creative community and nontraditional work atmosphere that I’m surrounded by. So many people here are involved in the arts or events or some other occupation where work doesn’t mean sitting behind a desk from 8-5, which often leads to really interesting collaborations and projects. Husband and Wife! 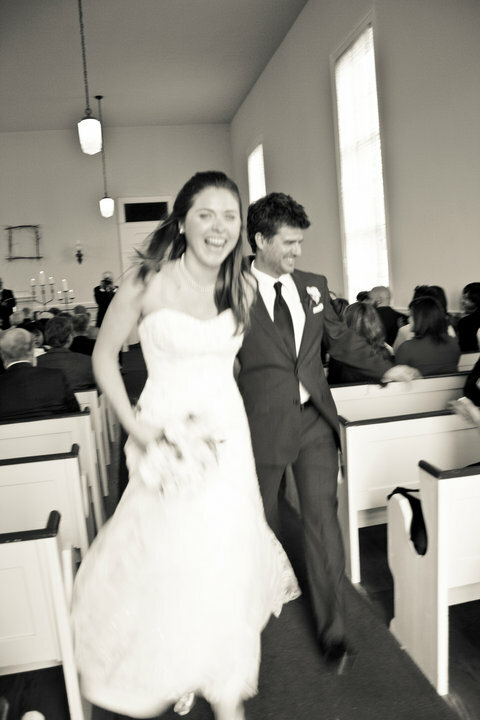 One of my favorite shots by Hannah Elaine Photography from our Jan 2010 wedding. Hannah and her husband John are often our partners in crime for everything from canoeing to improptu trips to the art museum (John was one of Keith’s roommates back in both of their bachelor days) so when she needed a shoot location (and a few “models”) Keith and I were game to offer up our backyard and gather a few friends. 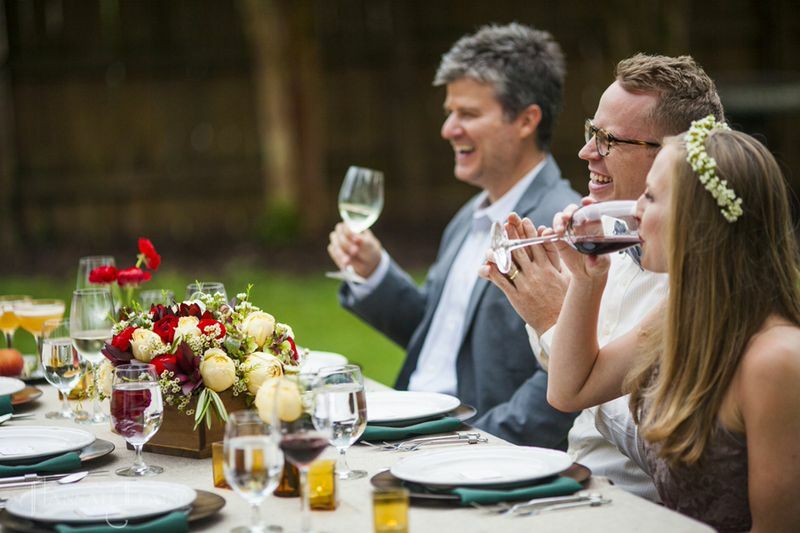 It wasn’t the first time that we’d had a wedding-related-backyard-dinner party: just a couple of years ago we hosted the wedding rehearsal dinner of our dear friends Bubba & Erin, so naturally we were thrilled that they could be part of this shoot! It was a sentimental nod to their big day and great to catch up. Hannah’s husband John and our good friend Keely sat in as “models” as well and the six of us had a blast sitting around our table in the backyard while Hannah snapped photos right and left. I just thought I’d pass along some fun photos for you to enjoy…and I might have one or two more related posts up my sleeve in the coming days, so be sure to check back. Cheers: To friendship and fotoshoots. 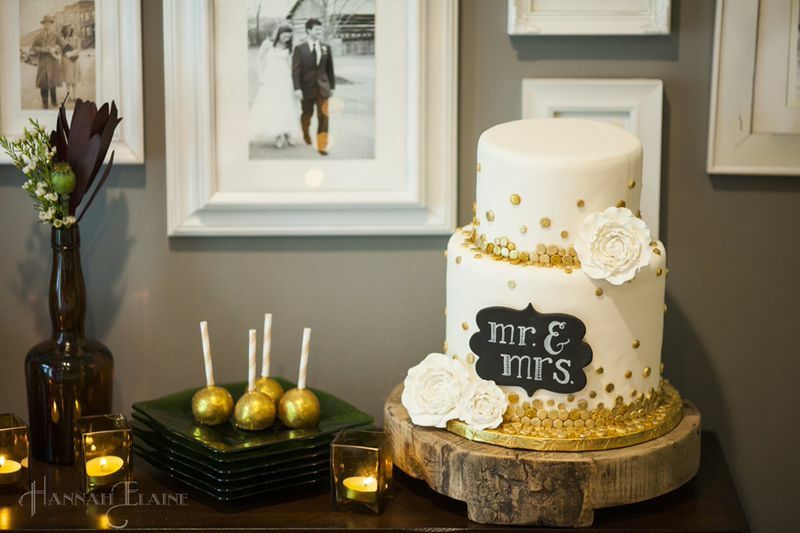 Cake balls and wedding cake by Frosted Affair. 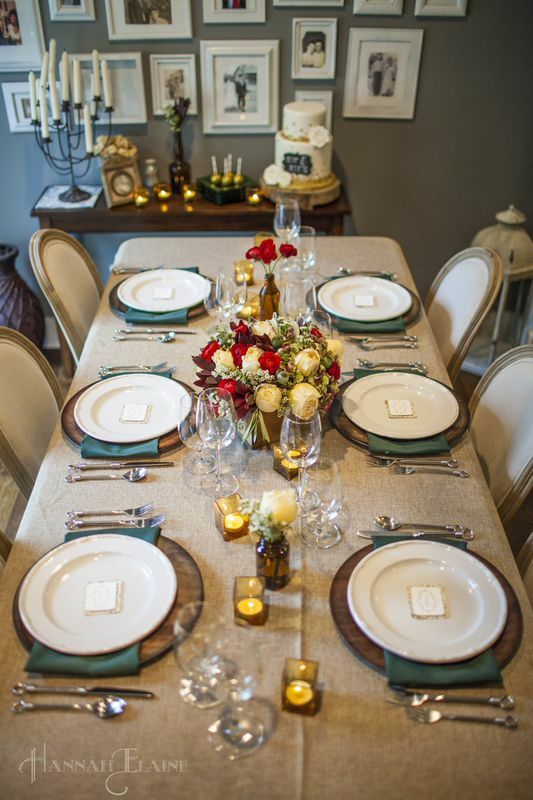 I love that the photo on the wall behind the cake is an actual wedding photo that Hannah shot over 4 years ago at my wedding, as well as a sweet photo of my grandparents off to the left. 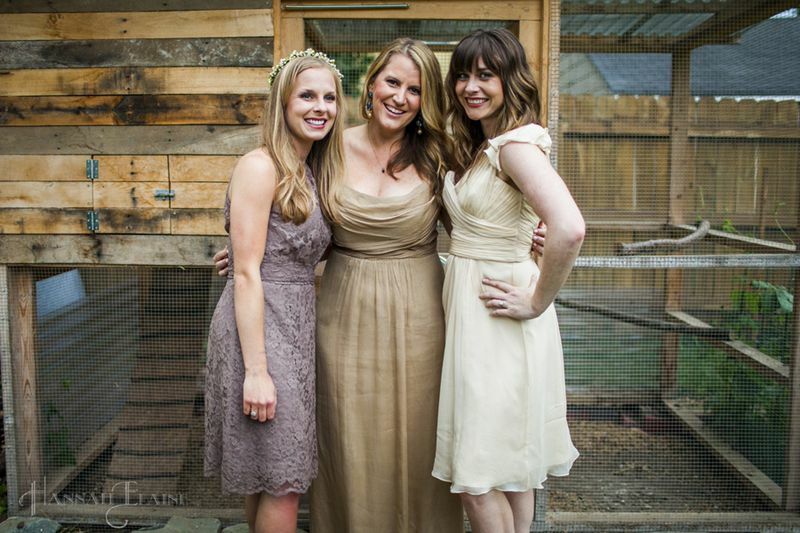 L to R: Erin, Keely and Me. Thankful for the sweet friendship these girls bring to my life. Gift boxes by Batch. 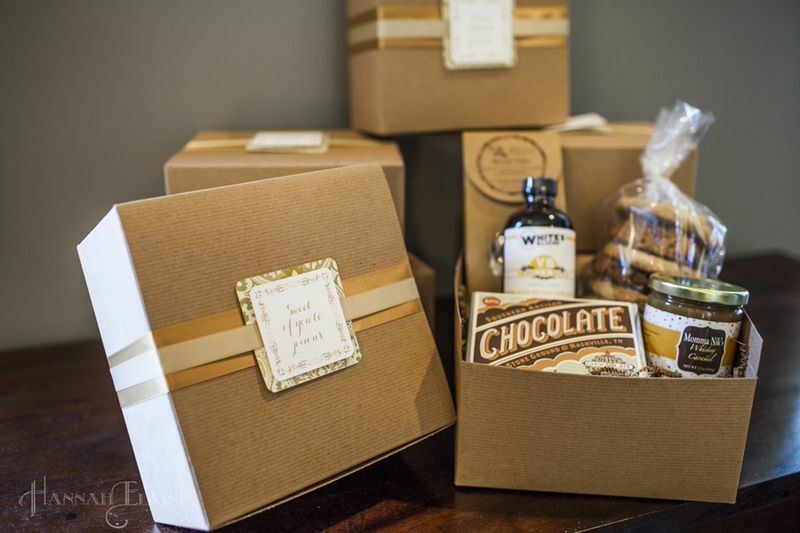 We were so excited to receive a box with lots of local personal care products and an adorable dishtowel! Wish my table looked this amazing all the time! 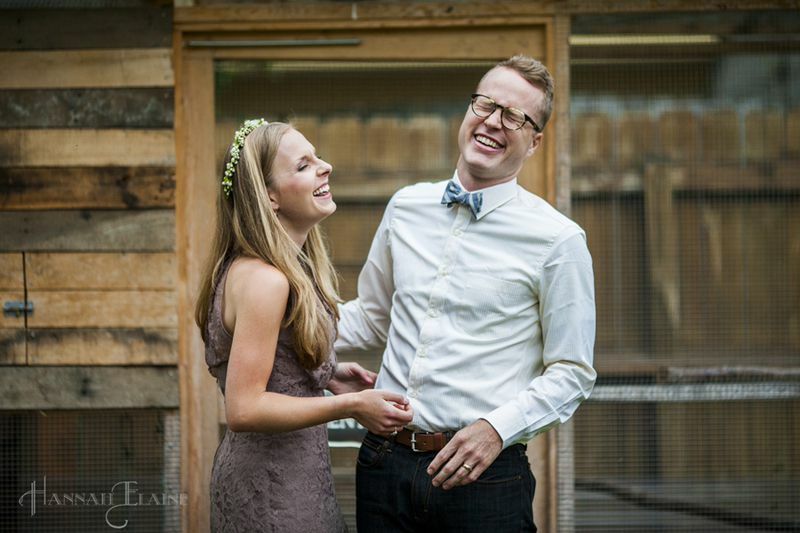 Bubba and Erin….these two crack me up to no end. So fun to have a second Bordeaux/Frizzell backyard dinner party. 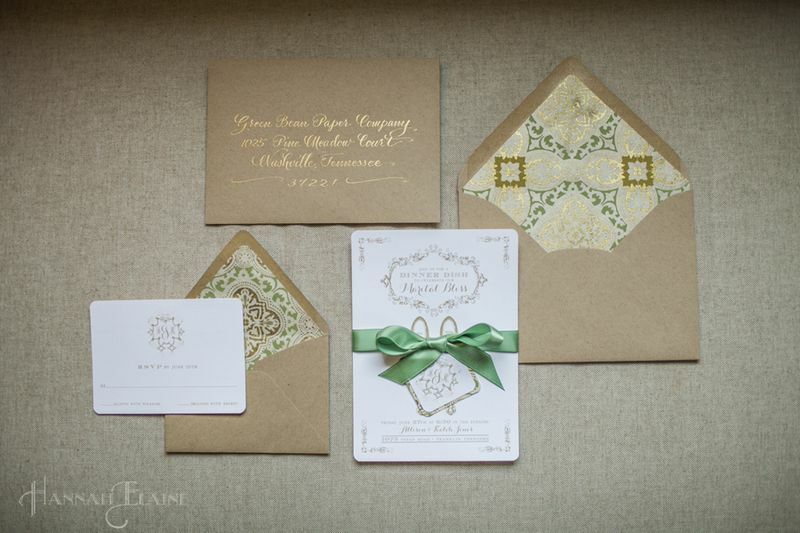 Paper goods by Maria of Green Bean Paper co. Such a fun girl and such adorable paper goods. Nothing brings me more joy than watching my husband laugh. Thanks Hannah for this sweet portrait of Keith and me. Love this man. 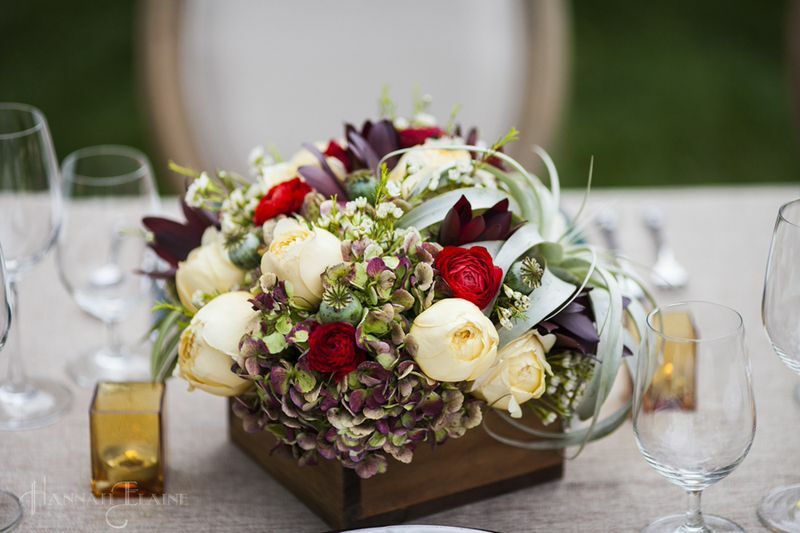 Nothing better than fresh flowers!! 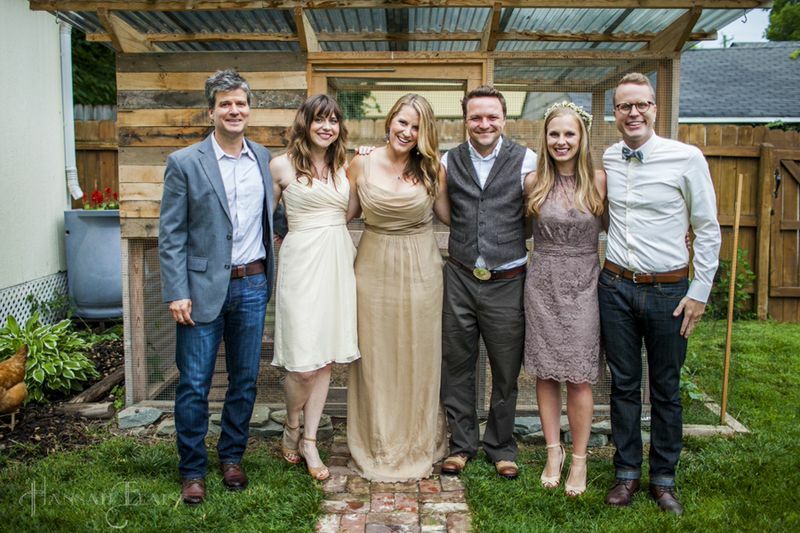 L to R: Keith, Me, Keely, John, Erin & Bubba. The “model” squad. You can check out more images from the shoot on Hannah’s blog by clicking here. And check out our amazing vendors as well! They were all amazing to work with and the best at their craft. (I’m trying to come up with an excuse to hire Hayley to come make my face look pretty again.) And you don’t have to be getting married to use their services. They’d be happy to help you out with any type of party or gift needs.